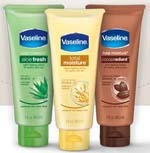 Today, May 29, 2012 at 8 p.m. EST (6 p.m. MST), Vaseline on Facebook is giving away 1,000 free 3 oz. samples of its Vaseline Total Moisture Lotions. You’ll need to make sure to fill out the form exactly at that time to grab one. Good luck!